From the recent comments and postings on this and other blogs and from the “addas” at various Bijoya Sammilani parties, I keep on getting a constant message – maybe we are missing the good old style Durga Puja as it used to happen in this part of the world. We all can agree on one thing that back home, the Bijoya Dashami was one of the saddest day of the year. No amount of “Naru”, “Laddu” or “Ghugni” could sweep away the sadness. But when we came to this country, we discovered that Durga Puja does not have to end on one specific day. Each Puja committee celebrated the festival on non overlapping weekends and the festivities continued for weeks. As attendees to these festivals, we too felt the importance and the market value of our presence. Due to the short supply of the Bengalis in this region, we were in high demand. We are treated as “Patrons” and not as “Registrants”. These days, with all the major organizations having their Puja on the same weekend, we are missing out on this prolonged celebrations. In this foreign land, where social interactions between ourselves are so rare, we long for the opportunity to meet at a common place, spend some time together, exchange few words, share our joys and sorrows. This fragmentation of the festivities is tearing this fragile social bond in some sense. Many of our friends with whom we meet every year at these Puja festivals, could not attend the same venue. This never happened in the earlier days. However, I guess this was inevitable. When a society grows, such fragmentation is bound to happen. But thanks to Anandamandir and Bharat Sevashram Sangha, this year the festivities were extended by at least one more week and the members of our community could display their newly acquired fashion gear for few more days. Subho Bijoya to you all. 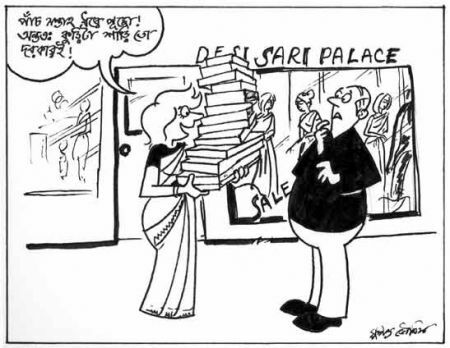 This entry was posted in Cartoons, Generic, Social and tagged cartoon, Durga Puja, festival, New Jersey by sudipta. Bookmark the permalink. and exposes fact!N.J.Kallol Pooja report are quite descriptive and informative particularly qurious MainLand(India)people like us.But one thing I failed to understand,the absence of any Pooja celebration Photographs,without that I presume a report or documentation is incomplete,in todays standard!Congratulation and thanx to N.J.Kalol Pooja comitee for another successful Durgotsav.All the best.